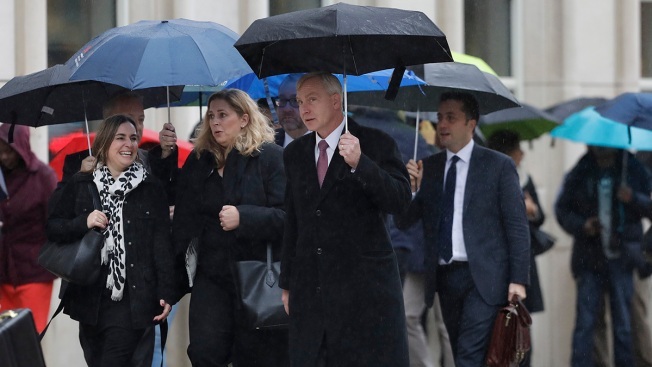 Richard Donoghue, center, the U.S. Attorney for the Eastern District of New York, enters Brooklyn federal court, Nov. 13, 2018. The U.S. Justice Department charged eight people Tuesday in connection with the takedown of two international cybercriminal rings that cost advertisers tens of millions of dollars. "As alleged in court filings, the defendants in this case used sophisticated computer programming and infrastructure around the world to exploit the digital advertising industry through fraud," said U.S. Attorney Richard Donoghue. The ads were never viewed by human internet users, prosecutors said. "In fact, the defendants faked both the users and the webpages: they programmed computers they controlled to load advertisements on fabricated webpages, via an automated program, in order to fraudulently obtain digital advertising revenue," prosecutors said in an indictment unsealed in federal court in Brooklyn. In one of the schemes, prosecutors said, the defendants accessed more than 1.7 million computers belonging to ordinary individuals and businesses in the U.S. and elsewhere by using a global "botnet," a network of malware-infected computers. "Meanwhile, the owners of the infected computers were unaware that this process was running in the background on their computers," prosecutors said. Most of the defendants are from Eastern Europe. Three were arrested overseas and are awaiting extradition. Two are from Russia and the other is from Kazakhstan. The others remain at large. Charges include wire fraud, computer intrusions, aggravated identity theft and money laundering. As part of their efforts, prosecutors said seizure warrants authorized the FBI to take control of 31 internet domains and information from 89 computer servers. "The FBI, working with private sector partners, redirected the internet traffic going to the domains (an action known as 'sinkholing') in order to disrupt and dismantle these botnets," prosecutors said. Google and Microsoft helped the U.S. and other international law enforcement agencies unravel the digital schemes, prosecutors said.